For shimmering projects and crafts, our Glitter Assortment 6 x 250g are a compact and popular resource. 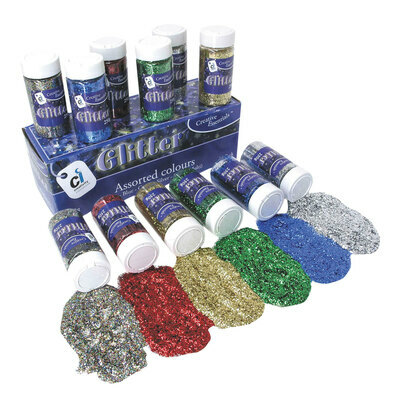 Suitable for all ages from primary school right up to older artists, this set of 6 assorted glitters are provided in a range of metallic colours and come in a loose glitter design. Perfect for decorating collages, paintings or even 3-dimensional crafts, simply sprinkle over glue or paints to create a twinkling display that is sure to delight. As part of our Classroom and Nursery range, this pack provides great value for busy educational environments and comes in screw-lid pots that can be securely stored with the rest of your Arts and Crafts collection until needed.